Coast Diamond is pleased to feature LaRog Brothers Jewelers, from the suburbs of Portland, Oregon, as our featured retailer of the week. For over a century LaRog Brothers Jewelers has been serving Portland, Oregon with their commitment to offer beautiful jewelry at the lowest prices possible with “unmatched customer service.” LaRog’s specializes in engagement rings and wedding bands. They believe being an independent, family-owned jewelry store allows them to offer the most on-trend, and even ahead of trend, rings you will find in the jewelry business. The Rogoway brothers, Dave and Rick, along with Dave’s son, Tyler, love being a part of this exciting time in a couple’s life. Visit the LaRog Facebook page and you will see all the happy LaRog couples. Make a statement with this 1.5 CT Coast Diamond engagement ring (LC5292) with two rows of sparkling diamonds on the shoulders. All the trends are beautifully combined in this Coast Diamond 1 CT halo engagement ring (LC5357) and matching wedding band (WC5357) with pave diamonds and milgrain edging. Ahead of its time, this stunning Coast Diamond wedding set (LZ5001H-WZ5001H) features graduated round diamonds on the shoulders and a peek-a-boo diamond at the side of the center stone. Congratulations LaRog Brothers Jewelers for your long legacy of excellence in the jewelry industry and for being our Coast Diamond Featured Retailer of the Week! Coast Diamond Featured Retailer: Paul’s Jewelry of Lafayette, La. Coast Diamond is pleased to announce Paul’s Jewelry of Lafayette, La. as our featured retailer of the week. Paul’s Jewelry of Lafayette, Louisiana began in 1954 as a family business and proudly continues as a family owned business today. Paul and Theresa Naomi opened the doors of Paul’s Jewelry in downtown Lafayette. As the second generation, their three children, P.J., Nancy and Patricia, began to “balance the values of the past with the vision of the future” in the family business. The third generation of Paul’s Jewelry is represented by Paul Jacob Naomi, III. Jacob and the entire Naomi family strongly hold to the “strength in the united family and a unique sense of purpose which translates into a business model based on trust, caring, respect and shared goals.” We invite you to read more about The Paul’s Family and their love of family and fine jewelry on their website. Coast Diamond and Paul’s Jewelry invite you to experience the tradition of love of family and fine jewelry at Paul’s Jewelry. From diamond earrings to the once-in-a-lifetime engagement ring, let Paul’s Jewelry and Coast Diamond help you find the perfect gift that lasts a lifetime… And in the Paul’s Jewelry tradition, for generations to come. For a casual day of shopping or an elegant evening out, these Coast Diamond stud earrings (EC30007) are the perfect gift of endless versatility. This stunning Coast Diamond traditional wedding set (LC5291-WC5291) features a 1.5 CT center diamond with a 6 prong setting and brilliant round diamonds that cascade down her finger. Intertwining diamonds meet to create a showstopping halo in this unique Coast Diamond engagement ring (LC5449). Congratulations Paul’s Jewelry of Lafayette, LA for being Coast Diamond’s Featured Retailer of the Week! Coast Diamond is thrilled to call Barmakian Jewelers of New England our featured retailer of the week. Barmakian Jewelers of New England has been serving customers for over 100 years with the best value, selection and service. Starting out in Boston, MA, Barmakian Jewelers is now serving the New England area with three stores (Boston, Farmington and Nasua) and over 25,000 square feet of showrooms. Even more exciting, you can shop at Barmakian’s from the comfort of your home on their online shopping website and Barmakian Jewelers offers you free shipping on any order over $250 on their website. This unique online shopping opportunity in fine jewelry allows Barmakian Jewelers to reach customers everywhere with their legendary service, extensive selection and unparalleled value. Click to view all Barmakian Jewelers awards and accolades. Barmakian Jewelers has been a WeddingWire award winner since 2011. WeddingWire is the most comprehensive wedding site of local vendors, serving the entire country, and Barmakian Jewelers has been honored as bride’s/couple’s choice for six years running. Barmakian Jewelers is an authorized dealer of Coast Diamond fine jewelry. Together we bring our customers the most superb in engagement ring design at a value that cannot be surpassed. 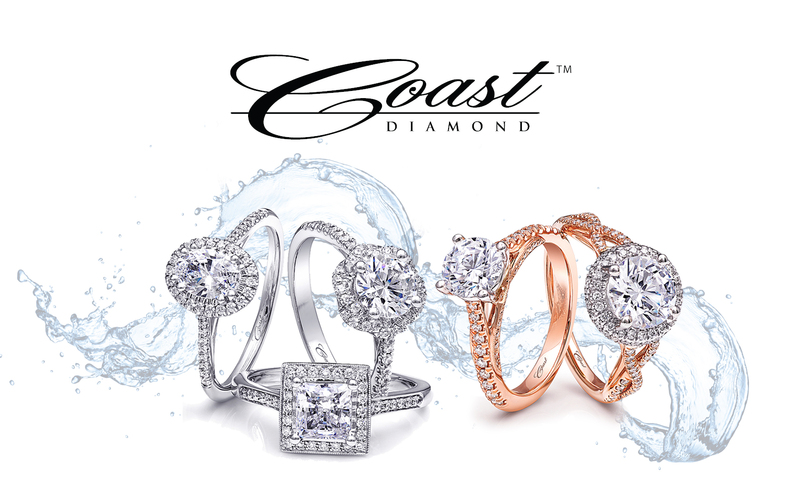 Each of our Coast designs can be personalized to your taste, so you have an engagement ring beyond your expectations. Barmakian Jewelers invites you to “Come in, browse, dream, and shop for an occasion, for a loved one, or yourself”. You will find these and other stunning Coast Diamond designs on the Barmakian website or in one of their New England locations. Unique Coast Diamond cushion-shaped halo engagement ring (LC5391RG) with mixed metals of white and rose gold, surrounded by milgrain edging. Bold Coast Diamond scalloped halo engagement ring (LC10072) with three rows of fishtail and prong set diamonds leading up to a 2 CT center stone. Gorgeous Coast Diamond double halo engagement ring (LC10130) with 1.25 CT center diamond and a split shank of diamonds to hug the finger. Congratulations Barmakian Jewelers for being our Coast Diamond Featured Retailer of the Week! Coast Diamond is proud to present Borsheims Fine Jewelry & Gifts of Omaha, NE as our featured retailer of the week. Borsheims Fine Jewelry & Gifts is like none other. Its history in the fine jewelry business spans over 100 years. Today, as one of Warren Buffet’s Berkshire Hathaway companies, Borsheims celebrates being one of the largest jewelry stores in the country. They continue to honor the business philosophy developed years ago by previous owners Louis and Ike Friendman: Offer an extensive inventory and exceptional customer service at the lowest possible price. Stopping into Borsheims 62,500 square foot retail space, which houses 100,000 pieces of jewelry, watches and fine gifts, and has a staff which prides themselves on exceptional customer service, you are sure to find the perfect engagement ring or gift for your special moment. At Coast Diamond we are honored when a Coast engagement ring is chosen for your marriage proposal. Summertime is the perfect time to propose to the one you love. During a spectacular trip, an adventurous hike, or an intimate dinner for two, we hope you will choose Borsheims and and one of these stunning 2 carat Coast Diamond engagement rings to help you celebrate the perfect proposal. Borsheims: Coast Diamond wedding set with 20 fishtail set diamonds on the shank of the engagement ring (LJ6023) and 12 on the wedding band (WJ6023). Borsheims: Coast Diamond elegantly scalloped halo engagement ring (LC10037). Borsheims: Coast Diamond cushion shaped halo engagement ring (LC10056), exquisitely contoured to compliment a 2 CT center stone. Congratulations Borsheims Fine Jewelry & Gifts of Omaha, NE for being selected our Coast Diamond Featured Retailer of the Week!